Doug Harris is my "go to" guy for radio sales promotions. His ideas are brilliant, easy to sell…and they make money for the radio stations that use them. Radio and TV stations around the world pay him $$$ to help them create innovative, attention-getting, money-making promotions. And he really knows how to create spectacular car dealer promotions. Does Your Radio Station or Ad Agency Have Any Auto Dealer Clients? 2. Invest the Little Bucks (and around 90 minutes) to have Harris give you a world-class education in what makes automobile dealers click…and more importantly, what makes them buy. Plus 12 tons of "Man, That Is Such A Great Idea!" automotive sales promotions for you to sell tomorrow. This Decision Really Is A "No Brainer"
Do you work at a commercial radio station? Do you have car dealers in your market? Want to have them spend more of their advertising dollars with you, rather than with your competitors? Really, this is an easy decision. And a very smart investment for you and your company. 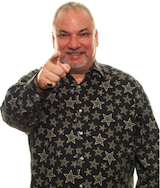 Doug will be sharing a ton of great automotive promotions sales ideas with you. The Study Guide will help you organize, understand, and remember it all. And because the Study Guide a PDF download, you can make copies for every member of your sales team. Immediate delivery! When you submit your order, you’ll be able to download this valuable audio seminar + PDF Study Guide immediately. Click the button below to add the CAR DEALER RADIO PROMOTIONS by Doug Harris (mp3 download) to your wish list.